The notion of gothic is quite rightly taking over the BFI at the moment. Their gothic season is looking set to be its most all encompassing and vast seasonal retrospective for some time. The gothic tint has found its way into a number of avenues including its DVD range. The Flipside label always seemed fit for the sort of gothic releases still residing in the archives. This month’s Flipside release is the second to delve into the dark heart of British cinema and find all sorts of wonderful curios (the first being the Flipside release of Saxon Logan’s Sleepwalker). Schalcken the Painter (1979)by Leslie Megahey is a release that wouldn’t look too out of place in the recent BBC Ghost Story releases. In fact the film and the series share a number of links, perhaps explaining the likeness’ shared between them. The film is a gothic feast of a period drama with hints of ungodly madness and burgeoning eroticism in the time of the War of the Roses; a summation of all the BBC had been producing during the late 1960s and 1970s. And yet Schalcken does separate out from the other ghost stories around it, branching off into new territory while still aesthetically sticking to the general period gothic that the BBC had become so good at. It is interesting to consider that Megahey kept hold of this story for himself and didn’t relinquish it to Lawrence Gordon Clark for his, then finished, Ghost Story at Christmas series. In hindsight it appears to have been the right choice. The difference is instantly marked out in the story by taking into account the difference in source material. Instead of M.R. James, Sheridan le Fanu’s work finally gets a look in at the BBC having only been the subject of a mere three episodes of Mystery and Imagination as well as some later titles from Hammer Horror. Fanu’s work is vastly different to James’ in spite of occupying the same basic realm. Whereas James’ paranoia over his increasingly dated Victorian values made his beings more repellent and merciless, le Fanu’s seem more subtle and impersonal. Schalcken also has the added narrative bonus of being based on a true mystery of the painter Godfried Schalcken and Megahey takes full advantage of le Fanu’s world as well as the real-world possibilities. Watching Schalcken the Painter, the knowing viewer will instantly be aware of the film’s role as an episode of the Omnibus series. Megahey uses the real-world potential as a starting point to use documentary techniques to add to the atmosphere and sow the seeds for the horror’s effectiveness later on. It begins with a scene setting look at Schalcken’s real paintings, setting the story around one particular work. Charles Gray’s occasional narration lends well to its original Christmas time screening; his voice simultaneously evoking the occult through his work on The Devil Rides Out (1968) and the entertaining Victoriana of his role as Mycroft in The Adventures of Sherlock Holmes. Megahey seems far more concerned with pace and other themes beside the ghostly. The previously mentioned eroticism at first seems cold with the presence of naked models to paint being a chore rather than a pleasure. The eroticism comes full circle though for the film’s horrific climax, showing the culmination of the film’s painting of focus with startling confidence. This climax is genuinely horrific, seeming to be dream-like but also heavily implied as the inevitable dramatic conclusion ever since the ghoulish creature’s first demands for the patron’s niece that Schalcken has fallen for were made. Elsewhere on the release are two short films, both of which tap into similar themes of the gothic. The first is Edward Abraham’s 1962 Poe adaptation, The Pit. Being a more experimental version lends well to its capturing of Poe’s imagery. The crisp black and white photography instantly reminds of Jan Švankmajer’s later interpretation of the story with a number of similarities. However Abraham’s just falls short of Švankmajer’s but is still a disturbing and tense piece of art-house short film. The second is a far more intriguing affair. Digby Rumsey’s The Pledge (1981) has so many Folk Horror tropes that it’s surprising to find that it has not amassed a cult following. The film is a stark evocation of Irish “weird fiction” writer Lord Dunsany’s story, The Highwayman, and is a real treat. Its opening shot of a man hung from a gallows pole in the middle of a desolate, British landscape has the feel of a Michael Reeves film and indeed it is easy to believe that if Reeves had lived longer The Pledge is the sort of film he would have made. Rumsey’s link with sound departments (having worked on the sound for Bill Douglas’ My Way Home (1978) and Peter Greenaway’s The Falls (1980)) clearly show in a wonderfully contrasted score from Michael Nyman. It links the film to the previous Flipside’s Sleepwalker (1984) and, though at different ends of the visual spectrum, share period heavy (1980s) musical eccentricity. Also included on the release is a 40 minute documentary on the making of Schalcken the Painter and a book of essays. Again, Flipside has dug deep into the archives and has found a wealth of wondrous curios. Similarly to all of the releases, Schalcken the Painter and the other films have merits other than that of a cinematic trinkets; they are all excellent examples of when funding and priority was given to those with elements of risk, producing idiosyncratic work in the process while also channelling all that is gothic into popular media. 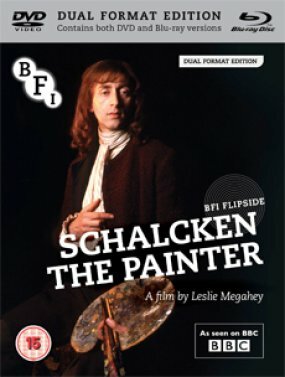 Schalcken the Painter is released by the BFI Flipside label on the 18th of November. A special screening of the film takes place at the National Gallery on the 4th of January. Other articles on BFI Gothic releases. BBC Robert Powell Ghost Stories. Robin Redbreast – James MacTaggart. The Masque of the Red Death (1964) – Kierkegaard’s Aesthetic Phase and Inverted Freudian Pleasure Principle (Part 2).